We are often asked “How did you first hear about alpacas?” Our answer is that we simply cannot remember a time when we did not know about alpaca! We grew up in Scotland at a time when hand knitted and hand sewn clothes were the order of the day. 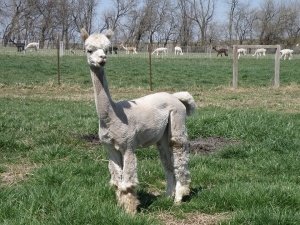 Alpaca was that wonderful luxurious fiber blended with wool to enhance it’s quality. Many years later and a continent away from our homeland, a television advertisement about alpacas and alpaca farming caught our interest. We were captivated by the grace and elegance of the animals themselves but even more so by their glorious fleece. After researching this new livestock industry we found there were exciting possibilities, not only in breeding and selling the animals but also in working with the beautiful fiber and the development of the fiber market. When a company move brought us from North Carolina to Kansas and our vintage farmstead, we found we had more pasture available than our horses needed. This seemed the ideal opportunity to embark on a new livestock career. 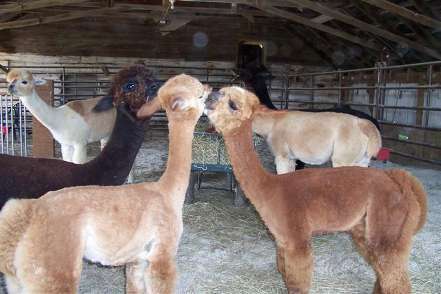 Our many years of livestock experience with horses, cattle and sheep have given us a sound foundation on which to build and refine our skills for application to alpacas. We give our animals individual care and attention while respecting their different personalities. We value education highly and are happy to share our knowledge with others while continuing to learn from knowledgeable veterinarians, educators and our fellow breeders. Far from our native Scotland, we maintain our Scottish values – hard work, honesty and integrity. We understand the value of support both before and after the sale and are happy to take the time to help our clients all we can. We welcome visitors any time – call us to schedule your visit. 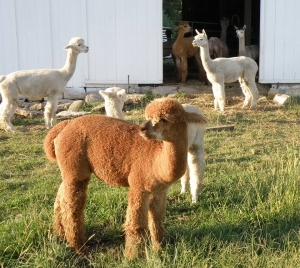 We’ll show you round the farm and tell you about alpacas, the growing industry in the USA.